Jagware presents a new Atari Jaguar CD compilation of four puzzle games from four groups; Do The Same from Cerebral Vortex, Diamjag by Orion, Atomic Reloaded from The Removers, and Beebris by Reboot - all four of which support online scoreboards. But that's not all - also included is an exclusive early look at the alpha build of 'Project II', Reboot's ambitious forthcoming horizontal scrolling shmup. CVSD's Do The Same is a beautifully presented tile-rotation game where your goal is to match a given pattern of blocks in as few moves as possible (and before the time runs out). A highly polished release featuring backgrounds based on hand-crafted clay models and 112 levels to beat, Do The Same was previously available on CD in very limited quantities - now those who missed it in physical form have the chance to grab it again! Next up is Atomic Reloaded, a logic puzzle game inspired by Thalion's Atomic in which you are tasked with creating molecules from their component atoms by moving them around a maze. Described as 'Atomic as it should have been', Atomic Reloaded features 82 original levels guaranteed to challenge even veterans of the original! Diamjag is an early release from the prolific Jaguar coder Orion, in which you must guide a ball-like character around 28 single-screen mazes collecting diamonds - the catch being that when your ball starts rolling you wont stop again until you hit a wall! Reboot, the organisers of this project have contributed Beebris, their updated Jaguar conversion of one of Law's old Atari ST releases based on a 'popular tetronimo game'. With four game modes, each with forty levels of difficulty, Beebris remains one of Reboots more popular additions to the Jaguar homebrew catalogue. 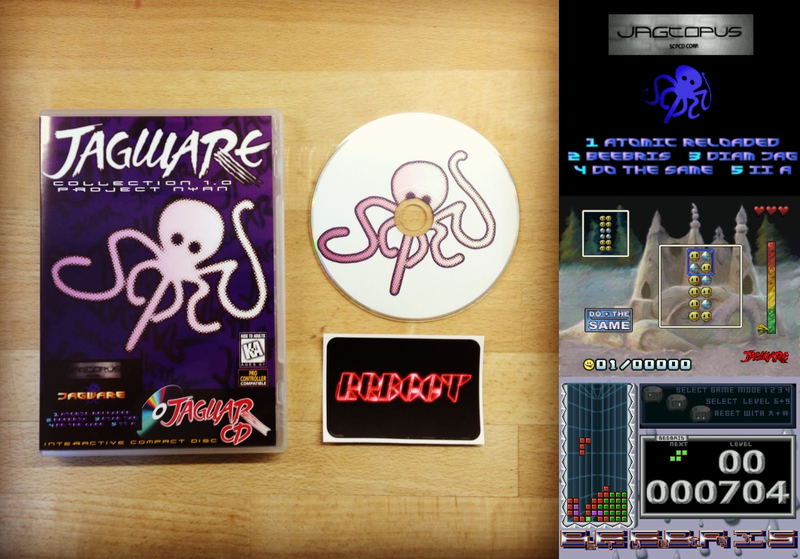 Jagware Collection One is a superb compilation of games, but if you want further incentive to pick up a copy you may wish to consider that all profits made through sales of this Jagware release will be going toward funding future Jaguar hardware development by SCPCD, creator of the JagCF and the Jagtopus 4-cart programmer - the format on which future cartridge games will be distributed. Priced at £24 (plus £4 UK/Europe shipping, £5 rest of world) Jagware Collection 1.0 is available to buy from our shop page today!